By the end of the 1960s, a large number of Irwin mango trees in Tainan area were experiencing an alarming phenomenon—they would flower but not bear fruit. 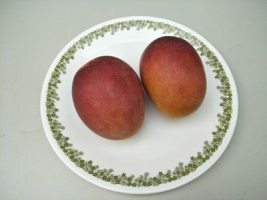 A pollinated Irwin mango would weigh between 300 and 400 grams. But many mangoes weren’t being pollinated, resulting in a majority of trees without mangoes. Taiwan’s Council of Agriculture formed a task force to solve the issue plaguing fruit farmers. However, more than ten years past, the farming predicament still remained unsolved. One day in 1987, Professor Lin Tzong-Shyan saw a reeking pig head under a mango tree that had attracted hordes of blow flies, and the sounds of the large-headed flies could be heard buzzing around several mango trees nearby. Noticing an abundance of mangoes hanging from these trees, Lin Tzong-Shyan connected the dots. Could these blow flies be the savior sent to solve the issue of mango trees not bearing fruit? During the mango flowering season of 1988, Lin Tzong-Shyan convinced a farmer to implement a grid shaped pattern in which the center area of every eight mango trees would have a pile of rotten fish or poultry viscera to attract blow flies. A few months later, the farmer had a bountiful harvest of mangoes. The output was several times higher than previous years. The problem of mangoes flowering but not bearing fruit, which had confounded Taiwan’s Council of Agriculture for so long, had finally been so creatively solved. Taiwan’s mango output skyrocketed thereafter.